Which of the following best describes the cause of thin film interference? Light reflecting from a medium having an index of refraction less than that of the medium in which it is traveling. 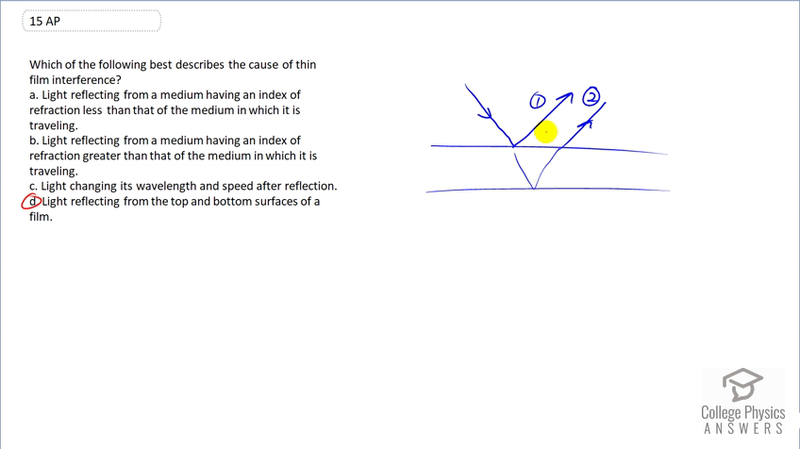 Light reflecting from a medium having an index of refraction greater than that of the medium in which it is traveling. Light changing its wavelength and speed after reflection. Light reflecting from the top and bottom surfaces of a film. This is College Physics Answers with Shaun Dychko. Thin film interference is caused by two different rays interfering with each other and the two different rays are caused by reflections from different surfaces. So the ray one is caused by a reflection from the top of this thin film surface and ray two results from reflecting from the bottom of the surface and then it goes through an additional path length difference here. And by doing so has a phase shift and then these two rays are going to interfere. And so answer <i>D</i> is the answer to this question.